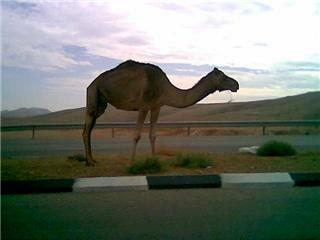 Driving home from the supermarket I was wondering why I did not see the usual herd of camels. I generally see them here in this stretch of the Judean desert. I looked to my right and sure enough, there they were. At a bit of a distance it was hard to see them, their color exactly matched the color of the surrounding desert; they blended it so well it was difficult to spot them. Then it hit me; this was part of their God-given natural protection from predators. They blend in with their surroundings, they don't stand out, and they survive. Camels can fight, believe me you don't want to get kicked or beaten by one, but if they can avoid a fight- they prefer it that way. So they blend in with their environment, search for some shrub to eat, and prefer to keep a low profile. But what do we do when on vacation? We wear an over-sized T shirt that says loud and clear "I am a tourist". We have a camera hanging over our chest, we have a map in our hands, and a confused look on our face. We might as well have a target painted on our chest saying, "Strike here for easy cash". What should we do? Be the camel. Blend in as much as you can, don't make it obvious you are a cash carrying tourist. So here are a few travel tips. Act confident, even if you are totally lost. Blend in as much as you can. If in a foreign country; learn a few words of their language. Don't carry the most obviously expensive camera. If paying in a restaurant or shop, don’t open your wallet for all to see. What I do is, before I get to the checkout counter, I pull out just a little more cash than I think I need, put it in a separate pocket, and that is all I show when it is time to pay. No one needs to see my cash, credit cards or personal family photos. If in a foreign country; learn the exchange rate before you are standing at the cash register about to pay. Everyone will notice you trying to figure out 'how much it costs in dollars'. This is an unfair delay for others, and, marks you as an ignorant tourist. Learn some of local social norms so you don't accidentally offend people, or make it obvious that you are an outsider. Ask the hotel clerk which areas of town are best avoided. Every town has such areas. Vacation time is no time to be a hero or play the Jean Claude Van Damme role.